Throughout the Grand Strand you will see information for Beach access parking along Ocean Blvd. at each street end. Watch for the "Public Beach Access" signs. Some locations are just a sandy path (watch out for burs) while others offer both free and paid parking. A few parking spaces may still be free, but for the most part, those days are gone. Instead, you'll find parking meters and/or pay stations. The law stipulates how any feet apart parking spaces must be, based on development and density. In recent years, parking and pay stations have been added to most of these areas. In the city of Myrtle Beach, parking meters are removed on Oct. 31 and they are re-installed on March 1. NEW! March 27, 2018 - Too many people - not enough parking? A new board could govern parking for all. Could Horry County get a parking authority to govern parking along the entire Grand Strand? It could happen within 12 months, according to county Council Chair Mark Lazarus. Lazarus and other coastal leaders discussed the plan at the Coastal Alliance Tuesday. "Everybody agreed!" Lazarus said. "The premise behind it is that the problem is not going away...it's only going to grow." Read more here! Signs are on Ocean Blvd. at each street end and most have parking meters. Depending on the area of the city, Myrtle Beach city meters cost $2. hour ($10. per day) down to $1.50 per hour, $8. day.) per hour. See City of Myrtle Beach for more information. The downtown Boardwalk also also offers public parking for a fee. North Myrtle Beach links for more parking information. Surfside Beach There has been a price increase in Surfside Beach. Parking lot meters and pay stations now charge $1.75 instead of $1.50. They have raised their fee to $2.00 to park at Surfside Pier. Parking rules will be strictly enforced from 7 AM to 7 PM More Surfside Beach parking meter information. Want free parking? You might consider driving south for a few miles south to Garden City Beach where you'll find free parking under and around the Garden City Pier. North End of Horry County | Beach access parking including both north and south of Ocean Annie's, at Maison Drive, Apache Campground and th eWyndham Myrtle Beach Resort. South End of Horry County| Beach parking locations: Rainbow, Sea Breeze and Cypress Street at Springmaid Pier, and Garden City Pier at Hawes,Woodland, Calhoun, Oak, Pine, Magnolia, Yaupon, Azalea and Holly Streets. Pawleys Island Parking locations include100 parking spaces. South End of the island and seven locations with limited parking. There is a location 0.8 miles north of the south-end parking area. Additional locations are off Atlantic Ave. at Hazard, Pearce, 2nd and 3rd Streets at Shell Road. North Litchfield Beach: Beach Parking More details: you can get off the beach at Parker Dr. just north of Windover Street, at the end of Windover Street, at the end of Fairfield Street, between Fairfield and Exeter Streets, at Seaview Loop, between Belvedere and Mariner streets,at the end of Mulberry St., at the end of Exerter Street, at Shorebird Loop, at the end of Songbird St., at the end of N. Nedia St. at the end of Summertime and St. and at the end if Loggerhead St.
Huntington Beach State Park on U.S. 17, Murrells Inlet. Huntington Beach State Park offers access to three miles of remote beach Admission: $5.adult; $3.25/ S.C. Senior; $3/youth age 6-15; Free for children 5 and younger. Myrtle Beach State Park | This park is 4 miles S. of Myrtle Beach on U.S. 17. Park Admission : $5 adult; $3.25/ S.C. Senior; $3/youth age 6-15; free for children 5 and younger. Sunset Beach NC | Parking is allowed on Main St. as long as vehicles don't block driveways. Oak Island, NC |Most street-endss at the beach offer street-side parking facilities. Where to park in Myrtle Beach? NEW! Please note that many (but not all) parking meters have been replaced with "Parkmobile" signs. Click HERE's my photo . 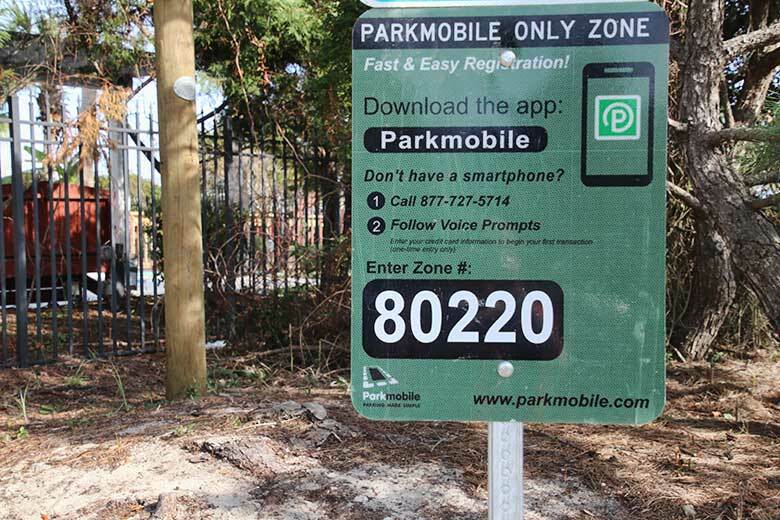 Download the park-mobile and enter the PHONE number. IIf you do not have a smartphone, there is a toll-free number you can call. See photo linked just above for more information. Unless told to do so bt police or trtafic control device, motorists can't park within 10 feet of a fire hydrant, 20 feet of a crosswalk at an intersection or 50 feet of the nearest rail of a railroad crossing; alongside a curb painted YELLOW or on a bridge. Some curbs along Ocean Boulevard north of 32nd Avenue N. were painted yellow for the new parking changes in the north end that originally allowed city residents with decals to park along certain parts of the curb. City codes were later changed to allow parking along Ocean Blvd., north of 32nd Ave. N.
Parking changes are in effect for the residential areas of Ocean Blvd., from 31st Avenue North to 82nd Avenue North, east of Kings Highway. Guest place-cards for the property in the affected Avenues will be available at Lanier Parking on the first floor of the Pavilion Parking Garage. Present proof of ownership or tenancy to obtain four guest placards per home. The place-cards may be used only on the street for which they are issued. A resident parking decal is avvailable for $100. per year. The non-resident decal will allow vehicles to park in the Entertainment District, but not in the residential areas of North Ocean Blvd. For more information about parking areas, please visit: www.cityofmyrtlebeach.com/boulevardparking.html. That page also contains information about obtaining parking decals for in-city golf carts, which must be registered with the South Carolina DMV and property tax must be paid on an in-city automobile. Non-resident golf carts in the area mentioned above may obtain a decal if properly registered with the DMV. Parking meters in the city of myrtle beach are in effectbMarch 1 through October 31 and are enforced from 9:00 a.m. to 12:00 a.m., 7 days a week. The meters accept charege cards and debit cards. NEW! Information in the paragraph applies ONLY to the city of Myrtle Beach (not North Myrtle Beach, Garden City Beach, Surfside Beach, etc. All parking meters take U.S. coins, some take credit and debit cards, while pay-stations accept coins, U.S. bills up to $10, credit cards and debit cards. At a pay station, pay the machine for the amount of time you plan to stay, then display the printed receipton your car's dash. The Market Common Parking is free on the streets and 2 garages located within in The Market Common district. This may not last forever, but right now (2018) it is the current law. Pavilion Parking Garage 9th Ave. N. Kings Hwy. Anyone can purchase a 7-day consecutive pass for a "paid visitor" pass" for $30. Parking offer good only in the Pavilion Garage. Enter the garsage nd pay there. It is located at 9th Ave. N. and Kings Hwy. This parking pass is NOT valid for decal-parking areas.A seven-day visitor parking pass is available for $30 from the Lanier Parking Garage (in the Pavilion Parking Garage, Ninth Avenue N. at Kings Highway.) The pass is good for 7 consecutive days at all paid public parking area, but not in "decal only" parking areas. A non-resident parking placard is available for $100 per year from the Lanier Parking Office in the Pavilion Garage. This pass is good for public meatered stations between 21st Avenue North and 6th Avenue South, and in the metered street ends, from 69th to 77th Avenues North. This pass is not valid in "decal only" parking areas. On a daily basis, rates may change at the Pavilion Parking Garage. Tdaily rates increase during tourist season and for special events. Vehicles with valid handicapped license plates or hang-tags, as well as vehicles with valid Purple Heart, Disabled American Veteran (DAV) or Medal of Honor licence holders park free at the city's parking meters and at the Pavilion Parking Garage See City of Myrtle pay stations arfe inside the garage, and are good for weekends and nightly parking. Also, you can call Lanier Parking at (843) 626-7275 for updates on rate changes, such as increases for special events, and scheduled venues.